A new story from Beth and her relationship with Dan and how it is effected by KLS, March 2017. Gemma's story featured in the Chat magazine (2017) - her story was also featued in the Daily Mail in December. 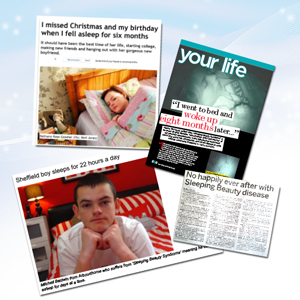 Connor Story featured in the Metro December 2016, and in the Mirror, Connor has KLS since he was 12, and slept through Christmas three times. A word version is here. An update on Beth's story on in the Daily Mail and a mention of a number of other UK cases of KLS including Lois and Carew. (Autumn 2016) - Daily Mail KLS feature or pdf. Claire Olney is 17, lives in the Santa Rosa area of the states and has shared her story, she has had KLS since she was 13 then and since then she has had six episodes. An article about here is here: Claire's KLS Story or as a pdf. Cody Young had KLS for 20 years before he found out a name for the condition. You can read Cody's KlS Story here or as a pdf.
" Patient" is one of the most trusted medical resources online, supplying evidence based information on a wide range of medical and health topics to patients and health professionals, and has an interesting article on Kleine Levin Syndrome or as a pdf. 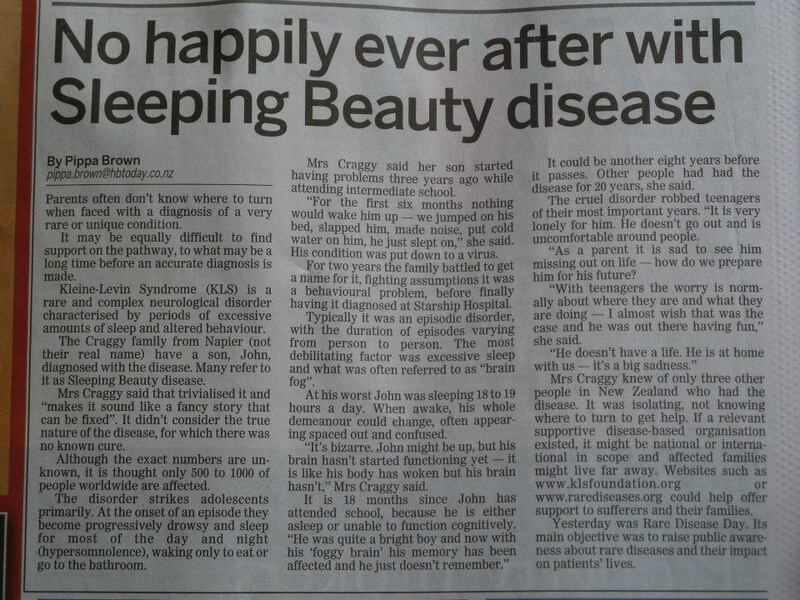 Sleeping beauty article and the loss of time. Read here about stress triggers! Jody, a 24 year old mum shares her story in the Reveal Magazine - December 2015, and her hopes to be awake this Christmas. Georgia's study - age 19 and from Adelaide in Australia, her story was featured in the Aussie Daily Mail (Summer 2015) “There’s no treatments, there’s no cure, there’s no medicine, there is nothing to stop it being less severe, there is nothing to stop me from going into an episode,” she said. “You’ve got to put everything aside and just deal with it.”You can read her another story online here or view in in word. Matt's story - how KLS arrived suddenly and news that he hopes KLS is improving. Steve Chapman shared his story to highlight that KLS does not just effect teenagers but adults too. (Daily Mail - KLS - Autumn 2013) and in Chat magazine - February 2014. Steve was 57 when this article was published and lives in the same county as us - we have met several times, so if this affects you I can put you in touch. Mikaylas Story shared by her mum, Tricia who is trying to raise funds to get to Stanford in January 2014 to have help with her daughter's KLS and other medical issues. Please read her KLS story. Tyler's story - age 17 and an update when he graduated highschool from April 2013. Below are some of the videos we have watched that are available around the world about Kleine Levin Syndrome - a great way to try and gain further understanding about the condition, and I have my own channel now on You tube too - KLS on You Tube. Micheal's story - KLS struck age 14 ... and he is hoping to one day find answers for us all. Mat's video chanel - with his view on life with KLS, Mat is 4 years older than Jake. Steve Chapman - an adult with Kleine Levin Syndrome recorded on our local news channel. Connor's Story - Erin, Connor's mum talks on a Boston radio station about what it is like to have a son with Kleine Levin Syndrome and help they manage. Connor has had KLS since he was 11, he is 13 in this recording. (2013) and another clip of Connor with KLS here. Lois - age 14 and her mum Setta talking on Three Counties Radio about KLS. They were not yet diagnosed yet, but KLS is very difficult to diagnose as not everyone has heard of the condition. Beth - age 18 on Radio Manchester talking about what it is like living with KLS. This is a great insight into the condition from the young person's view point. Beth was interviewed a 2nd time, by Radio Lancaster in 2014 - and a copy of that interview can be found here. A 3rd radio interview is here (Radio 5 live - October 2014), along with a video from BBC Breakfast - Beth shown now age 20 along with her and her mum on BBC Inside Out - North West (below) - they are doing great things to raise the profile of KLS in the UK. Alanna's video on You Tube - explaining the living nightmare - worth watching! My strange brain - one of the first video's I watched. The real sleeping beauty - BBC program from around 2010. This is the first programme we watched about KLS and was our first insight into the condition, so we would like to thank Louisa Ball and her family for sharing their experience. Inside Edition, 2006, about KLS in the US - watch about Kleine Levin here - “Imagine being so exhausted, so overwhelmed, that you could sleep almost non stop for weeks, or even maybe months.” video features Kristie Brown and the Farber’s. An ABC television show on KLS with the Farber and Delein families. Kleine-Levin Syndrome sufferers feel a consistent urge to sleep. See video here. The Debra Duncan Show Live - 2000, Houston ABC affiliate KTRK - Television show dealt with the experiences of Kristie Brown and Stephen Maier with KLS. I am adding a book recommendation .. it has been discussed in some of the KLS forum's that I am in and I thought I would like to share it with you.... If you are a member of a book club or like to read... can I suggest you pop over to Amazon and buy "Althea and Oliver" - http://amzn.to/1yHqLcL . It does not hold any mircale answers... but it does raise the issue of Kleine Levin Syndrome in a different way... a way perhaps some people can relate too better.... and in places - well it is best to be broadminded... but I think that is always the case with KLS! After finding out about the book I emailed the author - Cristina and asked her about her experience with KLS and told her about this site... this is her response. Thank you for reaching out to me through my website. I apologize for the delay in my response, but things were extremely hectic around the time of the book's publication in October, and have only begin to settle down recently. In response to your question, no, neither I nor anyone I know has ever been diagnosed with KLS. I initially heard about it from a friend, many years ago, who had watched a news story about teenagers suffering from Kleine Levin Syndrome. Though I did a fair amount of research before writing Althea and Oliver, the novel is definitely not supposed to represent any kind of universal experience of KLS, and unfortunately the afflicted character does not necessarily find a resolution by the book's end. Thank you for sending me the link to your blog, which I found extremely compelling. I wish I had had access to such a personal account back when I was actually writing the book, it would have been very helpful. 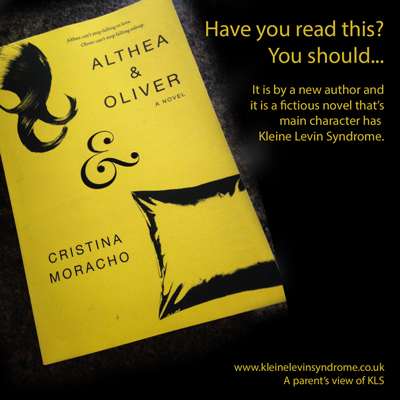 I hope you enjoy Althea and Oliver when you manage to get your hands on a copy, and I wish you and your family the best of luck as you continue your journey dealing with KLS. These web sites are the ones which we have found most useful in reading up about Kleine Levin Syndrome, or fighting for our child's future - so we have listed them here for reference. The arrest and detention of a disabled child - it always worries me that if my child goes into episode whilst out and does something that he should not - and gets arrested - this is a useful guide. Not got a diagnoses - then SWAN UK may be able to help - take a look at this great resource. http://specialneedsjungle.com - information on the UK education system by some parents who have been through the system. All information on this site is © Kleine Levin Syndrome.co.uk 2018 - The information included on these pages is intended to be useful to families, friends and interested parties and talks about KLS (Kleine Levin Syndrome) from a parents perspective. We acknowledge that everyone's experience will be different, and we would like you to respect that we are not a professional body offering support, none of this information is presented by a medical professional - our backgound is parenting, childcare, disabled holidays and graphic design. Our aim for the site is to share our story, get the best help and support we can for our son, raise awareness, share the resources and stories we discover on our journey, and to hopefully along the way offer information to other families. We recommend you consult your specialist for the best advice for you and your family.